The Old Gentleman, with Schwalbe Marathons on, from Doohickie's blog. 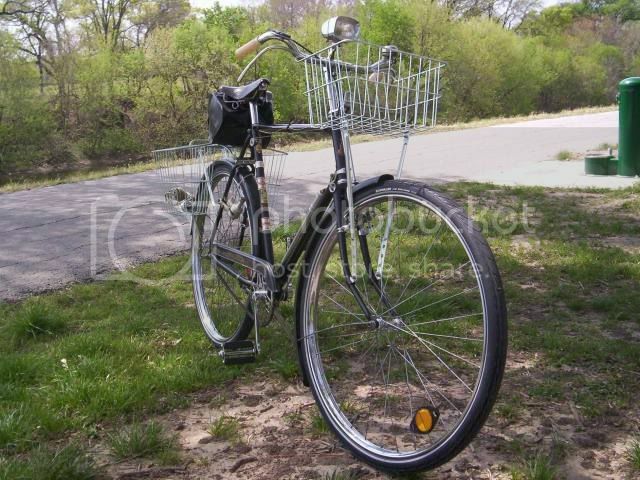 Reporting live from Trinity River Trail, blogger Doohickie has posted some awesome pictures of his old Raleigh roadster (aka “The Old Gentleman”) featuring a set of brand new Schwalbe Delta Cruiser tyres he ordered from us a short time ago. You can catch more pictures of his beautiful old bicycle, and his horrid commute on a tree-lined bike trail (wish we were all cursed with such a trail) in his recent post, “Celebrity Status” on Doohickie’s blog. Here’s to many happy miles on your new tires, Doohickie!